Tagged under Yuu Watase, Studio Pierrot, Light Novel, Series. Miaka is like any ordinary schoolgirl. She loves to dream, eat and enjoy her life rather than concentrate on her studies. She doesn't mind the fact her mother wishes for her to resemble her intelligent best friend, Yui, and life seems pretty normal. Things change when they both enter the forbidden section of the local library, and consequently fall into a book. The two girls find themselves in a place that resemble ancient China, where they meet their first love, Tamahome, and get caught up in a jealous love triangle. Miaka and Yui are no longer best friends and become enemies due to several misunderstandings, and are recruited as Priestesses for the Suzaku and Seiryuu Constellations in order to summon their Sacred God (in the form of a giant beast). The complicated battles between the Seiryuu and Suzaku end up in a fatal battle and race against time, involving the past and the present, where it is decided by fate. Fushigi Yuugi draws viewers into the fantastic realms of the imagination, love and friendship, to inform everyone of their importance in daily lives. Humour was first class, to me humour is an important part of anime...regardless of how serious the series is. I am usually irritated by how annoyingly fragile the female characters tend to be, while i am not expecting a butch female with a crew cut and bulging muscles, having one that does not have to share brain cells with a friend would be one hell of a surprise. 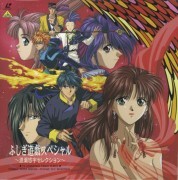 Fushigi Yuugi tells the story of the Priestess of Suzaku and her search for her seven warriors. Her name is Miaka Yuuki a middle school student who upon visiting the library with her friend Yui Hongo stumbled within the deepest part of the library and entered a room for employees only. There she encounters the 'The Universe of the Four Gods' where her friend Yui Hongo starts reading the book. Upon reading the first sentence Miaka and Yui were sucked into the book and transported to Konan. Within moments Yui was returned back to their world, Miaka not knowing that Yui returned to their world kept searching for her and that's where she encounters the first Suzaku warrior known as Tamahome. With mishaps created by Miaka she creates havoc while the emperor of Konan were making his rounds resulting in Miaka and Tamahome getting arrested for 'harassing the emperor'. She along with Tamahome was taken to the palace grounds and there she was declared as the Priestess of Suzaku, not knowing what impending danger she has placed herself in. Not only does she has to gather her seven warriors and summon Suzaku, she became enemies with her bestfriend who choose to be the Priestess of Seiryuu, constantly being hunted down by various assassins and fighting for her love with her warrior Tamahome. 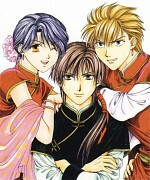 Fushigi Yuugi tells the story of love, broken frienships, danger and sacrifice. It´s really old and it has some really stupid parts but the story it self is very interesting and unic. It´s long but i didn´t get tired because there is always something that makes you whant to go on and see the next episode! I liked it alot! It made me laugh, made me cry (spoiler : Nuriko´s death), makes you say "WTF" and it makes you go "Oh my god loved it!" A friend recommended it to me, cause she remembered watching it in her childhood. I agreed to watch, when she told me there's a gay, who's in love with the emperor. Hahah, must have sound funny and interestig^_^ We watched together about twenty episodes in a single night. The rest I finished myself in next two days. Typical romance for young girls but cant stop watching somehow... It's quite old and I don't really like the art style (main female's eyes...), but the plot is worth it. Average series, Yuu Watase is one of my favorite manga authors. he series is one of the classics, one that everyone should see. You know, CLASSICS, the animes that inspired hundreds of mangas afterwards. When I watched it as a kid I thought I was so grown-up because of some of the sexual tension throughout the series, haha, but looking back on it, the series wasn't that sexual. Anyways, it's a good series and I'm sure has a lot of inner-workings with Japan's history. I definately recommend it. One of the first series that I saw. It's terrific! I love it. ;D The plot is interesting, the characters are well-developed and I like the music too. I haven't seen the movies yet, but I plan too. This series made me shed a tear. Another all-timer on my list. I couldn't remember when's the last time i've watched this but i could assure you that i have watched it so many times that i might story tell it to you right in this moment. haha! I love the characters, artwork, voice acting, and story. It had a nice balance of humor and seriousness. Not recommended for younger audiences, however, because Miaka seems to frequently misplace her clothes. Main characters get on my nerves a lot due to immature-ness and inability to do ANYTHING. Awesome eye-candy and the story is actually really good, if you can put up with the main character, the drama, and the major inter-misunderstandings. Amazing anime featured in Ancient China about a girl who fell into a story book, like many girls wish to do. Although Miyaka is not a typical female lead, She's an interesting character, and has interesting quality's. Mainly that shes a ditz and gluttonous. But somehow, she manages to save both her world and the universe of the four gods. Aside from Miaka and Tamahome calling each other's name's constantly, and a pretty repetitive storyline, it's actually pretty good. I just wouldn't watch it all in a marathon run least I want to take out some frustrations. 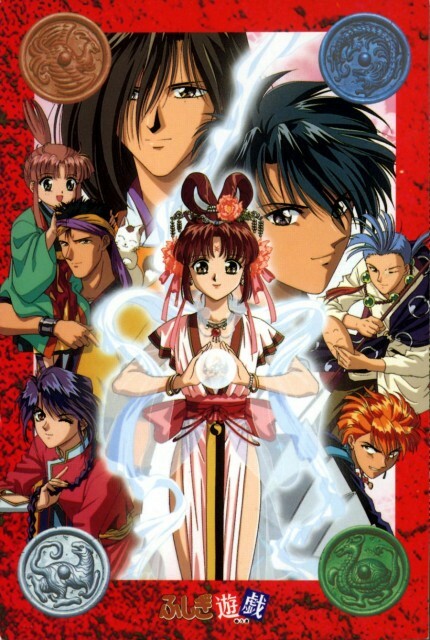 Fushigi Yuugi was good, but I prefer Fushigi Yuugi: Genbu Kaiden better. I didn`t like the main character, Miaka. Her friend Yui was better. The plot was really good and art too, but, I`ve seen other Watase`s works too, and I must say she can do better than this. anime was good also, I liked the OST best.